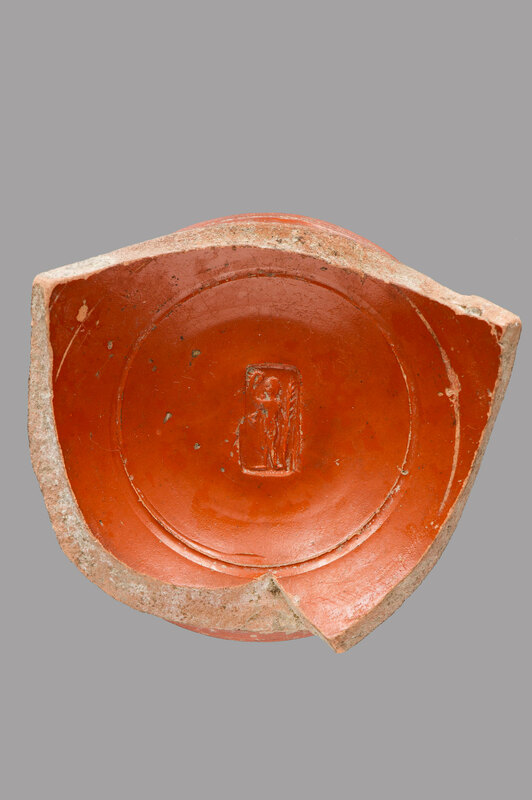 The interior of this fragment of a bowl preserves a figural potter’s stamp, perhaps depicting Ceres, the goddess of the harvest. Within the rectangular stamp, the standing female figure is draped from shoulder to ankle. In her upraised right hand, she holds a wreath; in her left hand, she holds a sheaf of wheat, an attribute of Ceres. This type of motif is often found on incised gems, suggesting that this potter’s mark could be an impression from a ring or other personal seal. The bottom of the vessel has a lightly incised graffito, which reads “EΛ”. This may indicate the Greek letters epsilon, lambda. This graffito may be a household or trade marking, such as those used to indicate a lot of pottery to be sold. 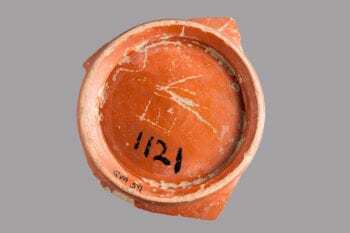 The sketchy nature of this inscription, in contrast with the more heavily incised letters of other fragments (such as 4 or 6) could also suggest a more informal, personal marker, such as the beginning of a name or initials. Robinson, D.M., ed. 1936. Corpus Vasorum Antiquorum: United States of America, The Robinson Collection, Baltimore, MD. 3 vol. Cambridge, MA: Harvard University Press. Pg. 56, no. 1a-b, pl. XLIV, 1a-b.